Janet Van Dyne’s legacy as the Wasp is interwoven through decades of Marvel Comics—but now, a new character is going to take the moniker. Who is she? What’s her agenda? What’s her connection to the Wasp’s legacy? 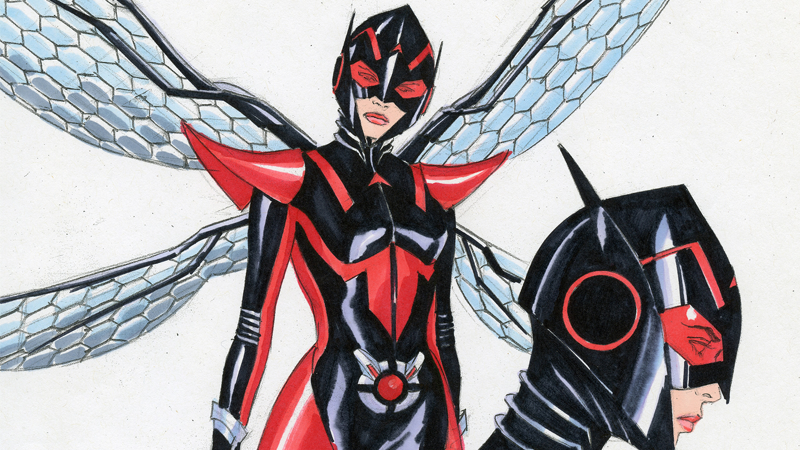 We sat down with writer Mark Waid to exclusively unveil the first details about the new Wasp. One detail Marvel is currently keeping mum on: her name. We may not know who’s in the new outfit, but we know Marvel is not looking for a replacement for the first Wasp. “[Marvel Editor Tom Brevoort and I] both love the Wasp, and we both love Janet Van Dyne—she’s instrumental to the Avengers, the one who named them. Everyone forgets, but she’s the one who recognizes that that guy they dragged out of the ice [as] being Captain America! She’s pretty sharp, and she’s always been a good, solid member of the team.” But Waid, who’s currently the head writer on the main Avengers comic book All-New, All-Different Avengers, leapt at the chance to add a new chapter to the story Janet Van Dyne’s hero had began. Janet van Dyne on the cover of All-New Wolverine #5, art by Bengal. Waid was at first wary at delving into the legacy of a character he loved. “[It was] a little terrifying,” he said, when asked about being approached to write the character. “I’ve always been a fan of the Wasp, the thing we had to be most careful about was making readers understand that this isn’t a dismissal of Janet Van Dyne or her legacy, and I think we’ve accomplished that in the way we’ve set up our story. “We’re not in any way trying to replace Janet,” promised Waid. Alex Ross’ final designs for the new Wasp costume. Image provided by Marvel. Alex Ross’ final design for the new Wasp costume, from the back. Image provided by Marvel. Janet will be aware of this new character taking on the Wasp identity (“I don’t think ... she’ll be particularly pleased,” Waid said) especially since the new character will actually have a much larger connection to another hero in the Marvel universe: the currently off-Earth Hank Pym, Janet’s former husband. So what sets the new Wasp apart from Janet? In terms of her power set, not much. “She very much has the same powers as Janet, but there’s some new wrinkles to them,” the writer said—but interestingly, those wrinkles will have a scientific background to them. Preview art from FCBD Civil War II #1, by Alan Davis. Image provided by Marvel. Shorlty afterwards, the Wasp will make a second appearance in All-New All-Different Avengers #9, and like Janet, they won’t be too happy to see this new hero.... if she even is a hero. “Remember, you used the word hero, not me!” Waid exclaimed. All-New All-Different Avengers #9 cover, by Alex Ross. Image provided by Marvel. After her appearance in Avengers #9, the new Wasp’s future will still be tied with the team. “She does not join the Avengers on their next mission in issues 10 through 12,” Waid told us, “but she will be part of a running subplot within the book.” It seems that it might be a while before we even begin to learn the character’s nature. “Ideally, we’d like to do more with her starting in issue 13, because we don’t want to answer the question yet about whether or not she’s friend or foe,” Waid concluded. Final color concept work for the New Wasp, by Alex Ross. Image provided by Marvel. But with Janet van Dyne still active as the Wasp, Scott Lang doing his own thing as Ant-Man, Hank Pym on his way back to Earth, and now this new mysterious person taking the moniker, it seems Marvel’s going all-in on its “biggest” shrinking family. The new Wasp makes her début in Free Comic Book Day: Civil War II #1 on May 7th.